Tottenham star Son Heung-min said Friday he was still waiting for Spurs team-mates Harry Kane and Dele Alli to wish him luck as he goes into Saturday’s crunch Asian Games final — with his career on the line. The 26-year-old, who is chasing a gold medal that would spare him nearly two years of military service, revealed that the England pair had yet to contact him, despite a huge outpouring of support back in London. “I wish they had texted!” Son told AFP before the clash with Japan in Cibinong, West Java. Son is 90 minutes away from the title and his last chance at an exemption that would allow him to see out his new five-year contract with Spurs. Failure is not an option as, without gold, the multi-millionaire footballer faces spending 21 months in the military, as is compulsory for South Korean men. South Korea remains technically at war with nuclear-armed North Korea, and the two countries share the world’s most heavily fortified border. “Of course it’s an important game, it’s a final, but it’s normal — I’m not thinking of it any differently,” he shrugged, looking to play down the pressure. Spurs only released their forward to compete as one of three permitted over-age players at the far-flung, regional under-23 tournament because he pleaded with the London club. “I want to play for Spurs too but the main thing is my country,” said Son, who played a captain’s role in his side’s 3-1 semi-final win over Vietnam in midweek. Nearly every able-bodied South Korean male is required to perform their military service before the age of 28, although the government rewards Asian Games gold medals and Olympic medals of any colour with an exemption. Son was selected to play at the 2014 Asian Games but his former club Bayer Leverkusen refused to release him — and the Koreans scooped gold. His tears after South Korea’s quarter-final defeat by Honduras at the 2016 Rio Olympics melted hearts, and thousands offered to do double their own military service in an online petition if Son could be pardoned. 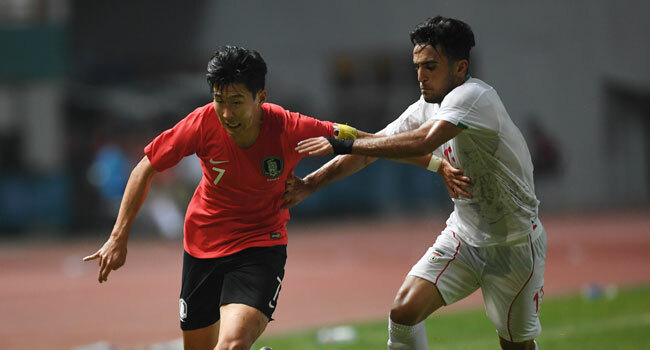 But Japan coach Hajime Moriyasu warned the Koreans to expect a scrap in the Asian Games final after the Blue Samurai edged the United Arab Emirates 1-0 to reach the gold medal game. “We know how strong South Korea are but my players are ready to leave everything out on that pitch,” he said. Well-wishers have taken to social media in support of Son, a fact not lost on the player.